If you have a thicker target grip panel on your Ruger 22/45 or you just would like to make it easier to get to the magazine release for competition shoots the TANDEMKROSS extended magazine release is a simple upgrade. This extended release gives you a wider face on the button as well as doubles the height of the original button. 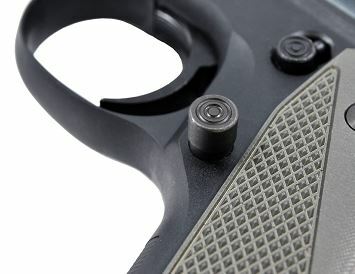 The design also matches the button face on the Kanewolf part from TANDEMKROSS to improve the look of your gun.